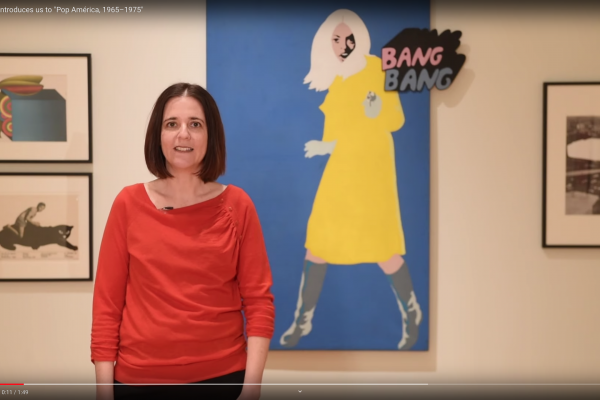 Portrait of Esther Gabara, E. Blake Byrne Associate Professor of Romance Studies and associate professor of Art, Art History & Visual Studies at Duke, at the opening of Pop América: 1965 - 1975 at the McNay Art Museum in San Antonio, Texas. Photo by J Caldwell. Join us to celebrate the opening of Pop América, 1965 – 1975 with guest curator and Duke Professor Esther Gabara, who will give a talk about the exhibition that was four years in the making. Support from Duke University for Pop América, 1965 – 1975 was provided by the Vice Provost for the Arts; the Global Brazil Lab and the John Hope Franklin Humanities Institute; the Dean of the Humanities; the Departments of Romance Studies and Art, Art History & Visual Studies; the Duke Brazil Initiative; the office of the Provost; the Office of Global Affairs.